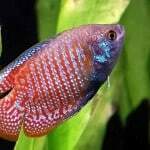 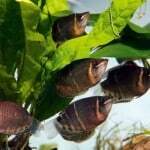 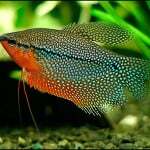 Compatibility: They are a peaceful community tank fish, but may chase other gourami type fish. 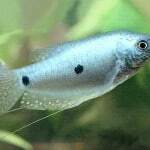 Best if kept with fish that are of similar size and temperament, but they can also be kept with smaller schooling type fish, that are too large to be eaten. 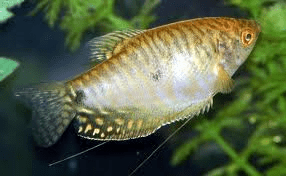 Males are best kept with 2-3 females. 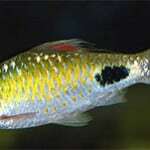 Sexing: Males are thinner and slightly brighter coloured. 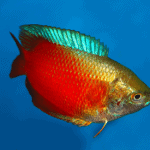 The dorsal fin of the male is pointed and the female is more rounded. 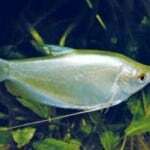 Additional Information: Other colours of this same fish are available such as blue and white. 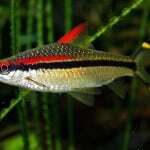 If only one is to be kept it is better to keep a female of this species.